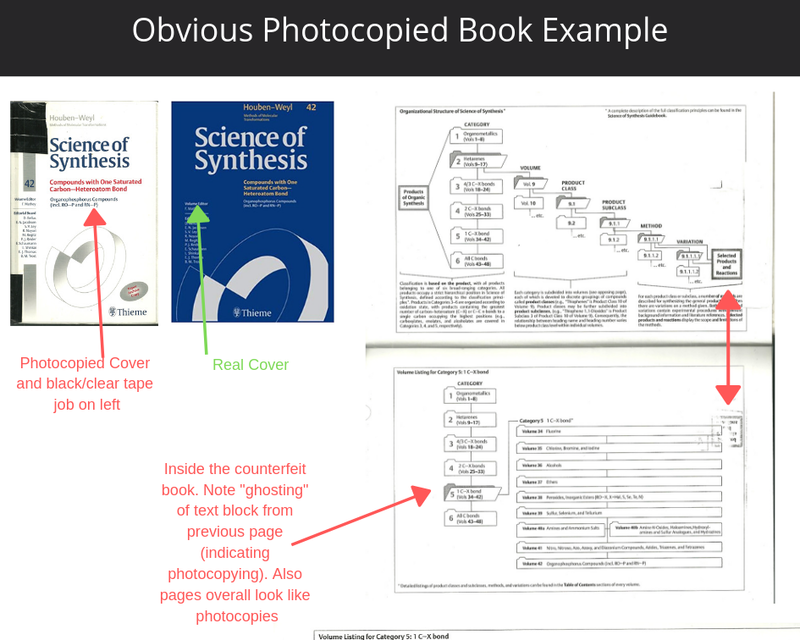 If you source textbooks to resell, note that there are counterfeits out there. Not enough to scare you into avoid the business entirely, but enough to keep your eyes peeled. As soon as the counterfeit copies are shipped and go through the cycle of being sold on other sites, it becomes difficult for the reseller to find out who exactly sold him/her the counterfeit book, and almost impossible to nail the perpetrator. In 2016 I made a video on how to spot counterfeit textbooks on Amazon. That black market has become a little more sophisticated and aggressive since then. I recently received an email from a reader (Fred) whose Amazon seller account got put on hold for 30+ days because a used book he was selling for $10 (!) was reported by the buyer (to Amazon) as counterfeit. Fred buys books in bulk from liquidators and - like most sellers, including myself - didn't think of checking them because "on the surface", each one looked legit as he listed them. Just to test my theory, I bought about 200 used books in an auction from Liquidation.com. Liquidation.com clearly listed the auction as "Amazon Liquidation", meaning Liquidation.com purchased the inventory from Amazon. (I don't recommend sourcing from Liquidation.com as the margins can be pretty thin.) 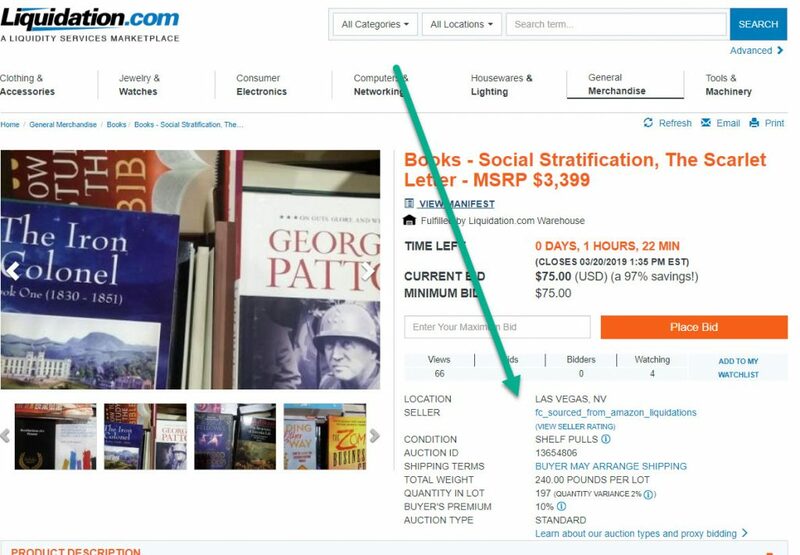 Below is an example e of a bulk used book auction on Liquidation.com. Note the "sourced_from_amazon_liquidations" indication (green arrow). You can click on the image to enlarge it. The books were at Liquidation.com's Nevada location near me (North Las Vegas), so I didn't have to pay for shipping the lot to me. Shipping ("freight") would have markedly reduced the already-thin profit margin. Now let's take a look of some signs of counterfeit books (thanks to Fred who provided images of his counterfeit inventory to me). 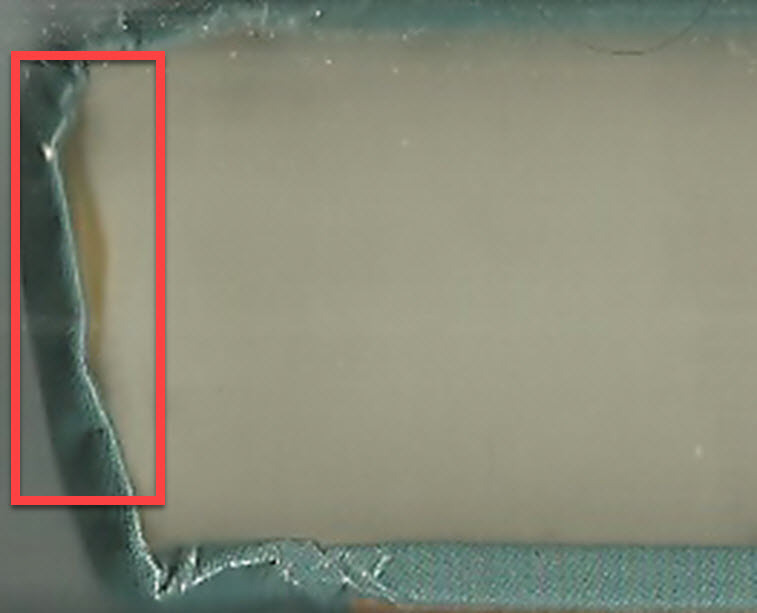 Note the glue between the binding and the pages is in 'blotches', not a neat linear seam. 3.) Wrong book dimensions and/or wrong # of pages. This is a little inconvenient to check. Many books on Amazon include the dimensions provided by the publisher. You can find the dimensions under the "Product Details" section. Here's an example. A counterfeiter will not bother ensuring their produced copies have the same height, width and depth. If you measure the counterfeit book itself, you'll see dramatic differences in almost all cases. Additonally, counterfeit books can have a total # of pages that differ significantly from what's indicated in the Amazon page (also in the "Product Details" section of a listing). Inspect your inventory before you buy. This is of course difficult if you're buying in bulk. But if the seller of the bulk books will not allow you to inspect the lot before you hand over your payment, take your business elsewhere. Instead of bulk buying, consider hiring someone (as a contractor, not an employee) to scout for books for you locally. They'll likely encounter far less counterfeits and you can refer them to this very blog post on how to identify fakes. BookToTheFuture's Nathan Holmquist has an excellent free guide on exactly how to do this. I used the guide it myself a couple years ago when I hired a local high school student to find books for me. If Amazon suspends your account or gives you a warning, comply with them politely and with the spirit of remedying "your mistake." ChannelAdvisor has a free guide to help you. They have additional advice here. Add new sales channels. Fred created an eBay account on eBay and Shopify. A popular service that duplicates your Amazon inventory on eBay is Joelister (I've used them before). And there is software that will take your Amazon listings and duplicate them onto your own Shopify store. Bytestand is an official Shopify app that will let you duplicate your Amazon products onto your own Shopify store (I haven't used this service). Why add new sales channels? In case your Amazon account is temporarily or perrmanently suspended, you'll have your books listed on other sites. Although your sales will likely be far less than what they were on Amazon, at least you have an immediate alternative solution to sell your inventory. Do you have any stories of sourcing counterfeit books? Post them below. – Book Flippers and Amazon Bulk buyers – most of those books come from the big players (TextBookRUS, RentU which is BookByte, Follett, Chegg, NBC). These are all the same people who have already been sued and are the ones who put the books into circulation so a high percentage of those stickered books are counterfeit. – The recent textbooks have little to do with the counterfeits in 2019. Sellers need to stop thinking about ‘popular textbooks, high-value textbooks’. Most of the counterfeits hit the market in 2014 with the big crackdown coming in 2016/2017 so anything selling well in 2013, 2014, 2015, 2016 or 2017 are where your going to find most of the counterfeits. These books are selling for $10 now, sales ranks over a million, publication dates going back to 2005 with newer editions out – its an absolute mess. These are the books bought in the last sting mentioned earlier and referenced in multiple lawsuits. – There are 103 Imprints on the list at the stop counterfeit books website last time I checked. The combination of those Imprint / Publisher names on Amazon (think different spellings / abbreviations) is over 620. This does not include all the blank publishers or ‘B’ ASINS people created to get around the restricted books. Meaning there is no way to just ‘scan’ your inventory looking for possible issues by looking for just the big 4 publishers names. – Does not matter who you acquired the book from if you sell a counterfeit book your guilty and if sued will need to defend yourself or receive a default judgement. Defending yourself means having a lawyer in NY and you can imagine the cost of that and that’s before a settlement. I’m just trying to get across the point that this is much more serious than losing your Amazon account. Agree 100% that sourcing locally is a much better idea but with that said my local community college run by Follett has multiple used counterfeit books on the shelves. When I asked the staff about their counterfeit training one of their safeguards was they only buy from students – I then asked if those students had to buy from them first – that was a ‘no’ which explained how all the counterfeits were getting on the shelves. At any rate anyone involved in textbooks should spend an afternoon using the Pacer system going through the lawsuits in NY related to counterfeit textbooks and looking through the books referenced in the lawsuits. These are just the lawsuits filed I’m sure there are several other settlements. 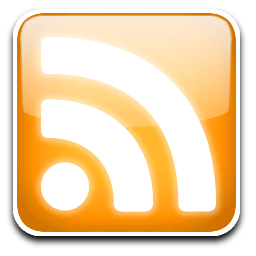 Hi, I think you have some good points here, but please if you have specific URLs/news stories that back up your points, please post them here. This is such an important article. The absolute number one piece of advice you can take from this is #4 … ADD NEW SALES CHANNELS!!! (I wrote that in caps because I’m yelling). If you only sell on Amazon you don’t own your own business. You don’t even own your own job. YOU WORK FOR AMAZON!!! (yelling again). You can be suspended or fired (banned) by Amazon at any time for no reason and you have NO recourse. You can say to yourself “I have nothing to worry about. 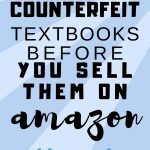 I would never sell a counterfeit textbook on Amazon”. 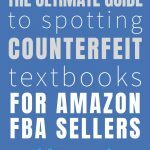 Well you don’t have to sell a counterfeit textbook (and you most likely will at some point because everyday more and more counterfeits are making it into the used book market). You just have to be ACCUSED of selling one. That’s what happened to me (I sold $100,000 + [gross] both of the last two years. My net was much, much, much less so I’m not fake internet bragging [Amazon kept most of the money]. The point being Amazon doesn’t care about you). I was suspended for a month and after several appeals I was reinstated. Fortunately I have other sources of income and I don’t need Amazon. If Amazon is your only source of income BE AFRAID, BE VERY AFRAID. And immediately add other sales channels. You’ve been warned. Reid this is very interesting, I’m embarassed I missed this article. Thank you for sharing! I’m glad to be of help, Rita. Aloha and mahalo, Jordan! I gravitate towards people of integrity, and you, sir, are a cut above! Thanks Joe! I really appreciate that! I have been experiencing mounting problems with Amazon, despite selling for a decade, with good metrics and feedback. I am slowly being put out of business. Amazon’s attitude toward my small business changed in Oct. 2018. I was accused of over 50 Pricing Errors and all of those ASIN’s were stranded. None of the pricing was wrong. I complained and protested over and over to no avail. Then as suddenly as they had appeared they all disappeared and were unstranded. Next came the 96 stranded ASIN’s due to not being Qualified to sell in the Category. The category is Books. I have been selling Books for ten years. That is about 120 expensive textbooks I can no longer sell starting in, the second busiest selling season, January 2019. Next, I have been banned from selling many more ASIN’s from more than a dozen publishers. It must be Amazon banning these ASIN’s yet there are still many small sellers in the marketplace. These actions have cost me thousands of dollars in sales. My business continues to get smaller and smaller. Now I am regularly being accused of Intellectual Property Infringements. Required to admit my crimes and explain how they will never happen again. It is a very weird world Amazon has now have created. I am a small seller who wants to sell textbooks, but I will soon have to find another platform. Amazon has banned the selling of my best sellers but won’t tell me why. They did agree to pay for the cost of shipping home all of my “Stranded” books and they gave me three months free Amazon fees. So in a way they have admitted guilt. But, still won’t fix the problem. Hi Bruce. I’m sorry to hear that. I do occasionally hear of stories like yours. I just added a new section to the above blog post about duplicating your inventory onto Shopify and/or eBay in the event a temporary/permanent hold or suspension happens. Here’s hoping Amazon recongnizes this and rights the ship – they count on 3rd party sellers for at least 50% (last I checked) of their sales. Previous post: Amazon Brand Restrictions – What to Do?